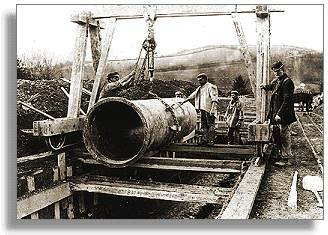 The Victorians also built an amazing system of pipelines, tunnels and bridges to carry huge amounts of water over 73 miles from the Elan Valley to Birmingham. This is called the Elan Valley Aqueduct, and although it has to cross many hills, valleys and rivers it sends the water all that way 'downhill' by gravity alone. The engineers came up with this system to save on the cost of having to use expensive pumping. The water travels at about two miles an hour, and takes one and a half days to get to Birmingham ! 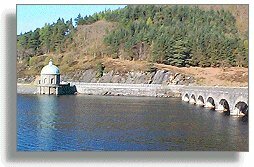 The system works because the Foel Tower, seen above, where the water starts its long journey is higher than the storage reservoir at Birmingham, and this was one of the reasons for choosing the Elan Valley for the scheme. The Victorian engineers used three different ways of carrying the water, depending on the part of the route they had to cross. Some of it was built by digging a large trench with picks and shovels - no JCB's in 1896 ! - and lining the sides with bricks and tiles. They put a roof over it and put the soil back so that there was no sign of the hidden 'stream' underneath. They used this method, called 'cut and cover' for around 25 miles of the route.